You are looking at the just released Movie Masters Bat-Pod. 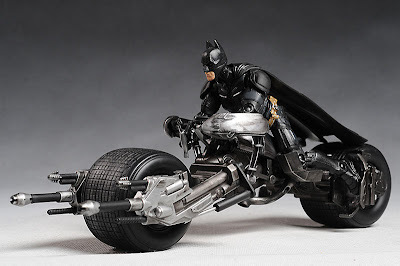 This Target Exclusive Dark Knight vehicle is selling for $20. The Dark Knight Movie Masters line has been pretty popular, and god knows we are all still searching for some of the rarer chase figures in the line. My two local Target stores didn't have the Bat-Pod yet, but hopefully it won't be as hard to find as Ghoul Batman. 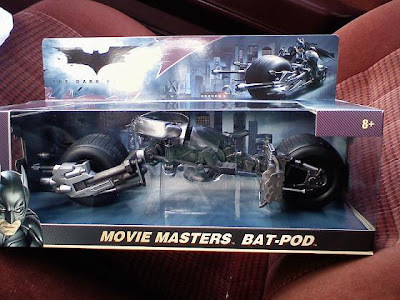 Anyways, the Bat-Pod is the perfect ride for all your Dark Knight figures or any other similar sized action figures. Poe Ghostal has posted an in-depth review of the Bat-Pod, so check it out.